Particles suspended in a solution often carry a net charge. Under the influence of a dc electric field (20-1000 V/cm) these charged particles move towards the oppsitely charged electrode and get deposited as film. These films are essentially a 3-D assembly of particles and thus possess a nanostructured morphology. This simple method of casting film has been widely employed in our laboratory to obtain nanostructured films of metal (gold, platinum), semiconductors fullerene, porphyrin and carbon nanotubes. 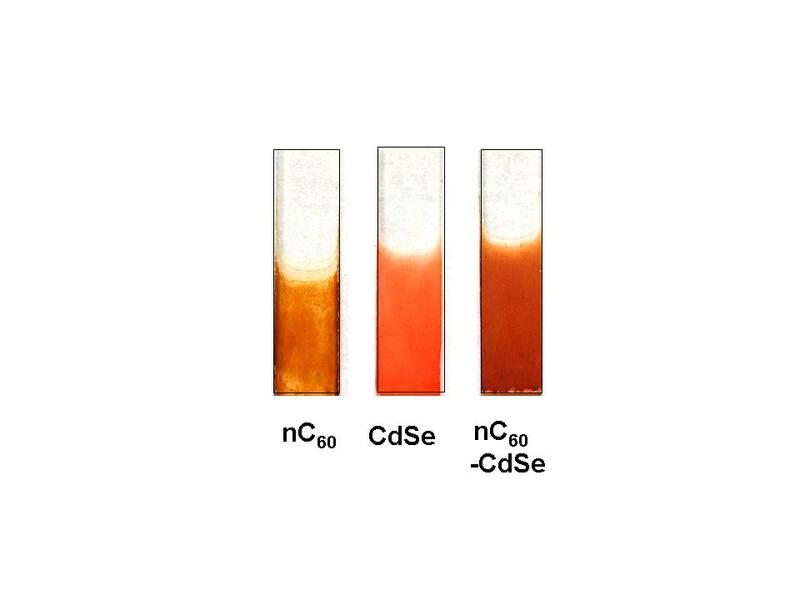 Examples of electrophoretically deposited C60, CdSe and C60-CdSe films on conducting glass are shown below. Note that these experiments should be conducted in a nonpolar solvent medium and should not involve oxidation or reduction processes at the electrodes. If you see any bubble formation at the electrodes, probably electrolysis is occuring and it is an indication that the applied voltage is too high. The electrophoresis provides electric field to drive the charged particles from solution towards the electrode surface and thus differs from the commonly used electrodeposition process. As always use precaution with high voltage power supplies while making connections.